Most frequently asked questions . . .
How do I add a voice assistant to an HTD WHA System? You have several options for sending the audio output of a voice assistant device, like a Google Home Mini, Alexa Echo Dot and Echo Input into your whole-house audio system. Click here to learn more. Is it possible to control HTD WHA Systems using home automation platforms and voice assistants like Alexa and Google Assistant? Our advanced Lync system, as well as our current mid-level MC systems, can be controlled by many of the most popular home automation platforms and apps, and many of those include voice control for HTD whole-house audio systems using Amazon Alexa and Google Assistant. Click here to learn more. A powered subwoofer, by definition, has the amplifier built in. The signal sent from the home theater receiver/processor is therefore a "non-powered" signal that needs to be shielded from its surroundings. Shielding prevents unwanted interference, specifically a 60 Hz "hum" from nearby electrical wires, from being picked up and amplified. We offer a shielded powered subwoofer cable in lengths of 12 feet and 30 feet. The other speakers in a surround sound setup (front left, center and right plus all of the surround speakers) do not have amplifiers built-in. Instead, they are powered by amplifiers in the home theater receiver. It is difficult for an amplified signal to pick up interference, so regular, unshielded speaker cable will do. We recommend 14 gauge cable because, in our experience, it is difficult to notice an improvement with even thicker cable. When running cable behind a wall or in the ceiling, most building codes will require that you use UL rated CL-3 cable which has a higher fire retardancy than clear jacket cable. Does HTD offer an in-wall center channel speaker? The center channel speaker is arguably the most important speaker in your system, but not because it reproduces sound any differently, but because in movies the center channel receives 90% of the dialogue. If you plan on using an in-wall speaker for the center channel then we recommend using a single speaker identical to the front left and right speakers for the center channel location. This is the only way to guarantee a 100% perfect “timbre match”, meaning that all three of the front speakers will sound exactly the same. When speaker manufacturers first started selling surround sound packages the sets were sold with five identical bookshelf speakers and a subwoofer. This inevitably caused complaints about the aesthetics of standing a bookshelf speaker on top of a television. The initial “fix” was to place the logo on the long side of one of the speakers so that the speaker could be positioned horizontally thus providing a lower, more pleasing-to-the-eye, profile. The problem is that listeners positioned more to the side of the tweeter (which produces the highest frequencies) would hear a "brighter" sound from the center channel speaker than those seated on the woofer (mid and lower frequencies) side. The solution has been to make a more symetrical speaker that contains a woofer on either side of the tweeter. The final result is a lower profile speaker that sounds essentially the same regardless of where you are seated. With in-wall speakers you will typically experience a major problem trying to fit a horizontal speaker with two woofers and a tweeter into a standard space between studs (approx 14.5"). And while we could design one that would fit, the odds are not good that the speaker would line up centered with your TV. For most people, an in-wall speaker that is positioned vertically does not have any negative aesthetic appeal. In fact, the best overall "look" is often also the best acoustic solution; that is, arrange three identical in-wall speakers (for front left, center, and front right) all in a row at the same height. You might have assumed that a center channel in-wall speaker should look different because most cabinet-style center channels, which are arranged more horizontally then vertically, look different from their comparable "bookshelf" speakers. The reason for this is best understood with a short history of the derivation of the center channel speaker: When speaker manufacturers first started selling surround sound packages the sets were sold with five identical bookshelf speakers and a subwoofer. This inevitably caused complaints about the aesthetics of standing a bookshelf speaker on top of a television. The initial “fix” was to place the logo on the long side of one of the speakers so that the speaker could be positioned horizontally thus providing a lower, more pleasing-to-the-eye, profile. What is the difference between the HD and MP lines of in-wall and ceiling speakers? Our MP (Multi Purpose) line of speakers offer great quality and produce a very nice sound, similar to speakers you might find at Best Buy only at a fraction of the cost. We designed this line with polypropylene cones, a silk dome (not just a fabric "soft" dome) tweeter, and a nice crossover. These are very similar to something like the Polk RC series with a few additional features that Polk does not offer on their RC line, such as the +/-3dB switch for the tweeter which allows the speaker to be slightly customized for your room or when matching the sound to other speakers in the room. This product line was primarily designed for general listening applications, such as whole house audio or background/ambient music. All of our in-wall and ceiling speakers have high power handling which means they will not distort at volume levels higher than most people will ever listen to. The HD (High Definition) line is more similar to a custom-install brand, such as Niles or Speakercraft, and was designed more specifically for critical listening applications. This includes home theater/surround sound rooms and dedicated listening rooms. The HD line was designed with aluminum woofers, ceramic-coated aluminum tweeters, and a 2nd order crossover. The lighter weight and stiffness of the aluminum drivers allows for a quicker, more accurate response from the woofer. Our ceramic-coated tweeter provides all of the crispness of other high quality metal dome tweeters with the added benefit of no ringing or harshness due to the ceramic coating. The end result is that the HD line produces a cleaner, more detailed and more accurate reproduction of sound than the MP line. The HD line is also more flexible in its applications. In addition to a +/-3dB switch on the tweeter, the HD line also offers a +/-3dB switch on the woofer giving the listener even more flexibility for adjusting the tone to accomodate room anamolies or the listener's personal taste. With its aluminum components and powder coated aluminum grille, the HD line is also well suited for high moisture environments, such as bathrooms and even covered areas outdoors. As a result, we took the extra steps of gel-coating the electrical components on the crossovers and using stainless steel mounting hardware to make them truly weather-proof. Both the HD and MP lines come ready for easy installation and can be painted to match any decor. All of our speakers include a 30-day guarantee and 5-year warranty. Is it possible to control HTD Whole House Audio Systems using home automation platforms and voice interfaces, such as Alexa and Google Assistant? How do I add a voice assistant to a whole-house audio system? How do I connect sources to my Lync whole-house audio system? Source input locations are conveniently located throughout your home! 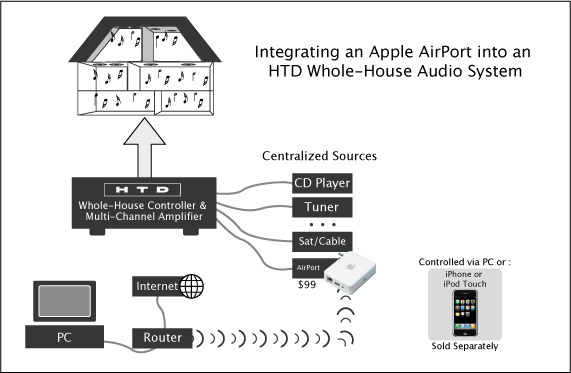 Most whole-house audio systems require all of your components to be located in one centralized area. Lync is different! From any LyncPad keypad, you can choose to listen to audio sources located not only in the central area, but also sources located throughout your home. This page displays three ways to get audio into the Lync system: A) connect directly to the Lync controller, B) connect directly to a LyncPad keypad, and C) connect to a LyncPad via an optional Source Input Panel. A) Control up to six centrally located devices. In addition to Lync's built-in MP3 player, you can connect an additional 5 sources directly into the Lync controller. These 5 sources can be controlled via IR pass-through by aiming the source's remote control (or a common universal remote) at any LyncPad keypad. This is because an IR eye is built into every LyncPad. IR information is routed only to the source selected by the LyncPad. This allows you to connect more than one of the same type of source with common IR commands (such as multiple cable or satellite TV boxes), but only control the one you want. 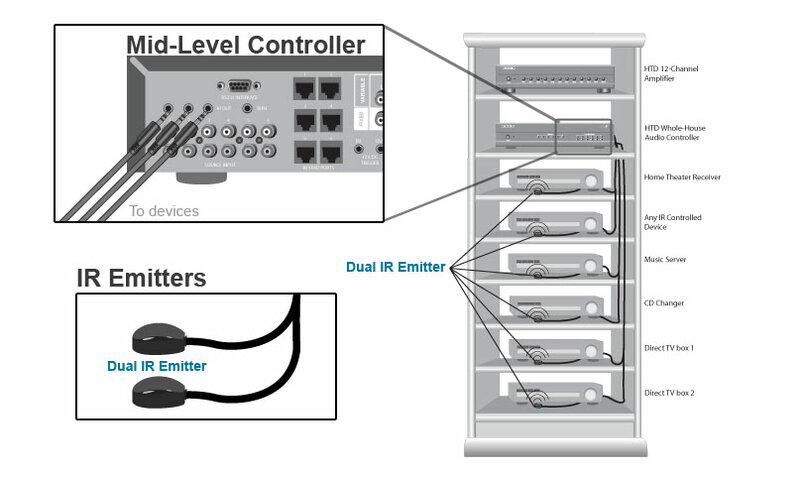 A separate global IR output is included on the back of the Lync controller allowing you to control up to two centrally located IR components that are not even part of your whole-house audio system. B) For extreme convenience connect any device with an analog audio output directly into the LyncPad. This includes standard headphone outputs. So when your friend says you need to hear a new song she just downloaded to her phone, just connect her phone with a short patch cable and the phone's audio is instantly connected to the Lync system and available to all zones. Stereo audio is digitally transferred to the Lync controller at CD-level quality. C) Add a source input location anywhere within each zone. When wiring your system, run a 5-conductor cable (or Cat5/6) behind the wall from the LyncPad to a more convenient source input location. This is usually the best solution for connecting a source more permanently within a zone. While a zone source can only be controlled from within its own zone, it is available for listening in all zones. How do I connect sources to my Mid-Level whole-house audio system? From any KC6 or KC7 keypad, you can choose to listen to audio sources located in the central area. This page displays how to get audio into the mid-level system: A) connect directly to the Mid-Level controller (or controller/amplifier). A) Control up to six centrally located devices. These 6 sources can be controlled via IR pass-through by aiming the source's remote control (or a common universal remote) at any keypad. This is because an IR eye is built into every keypad. How do I use the intercom with my Lync system? The Lync whole-house audio system includes an integrated point to point intercom. 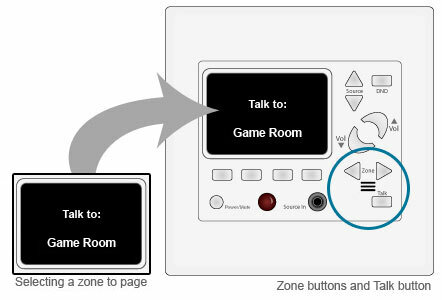 Use the Zone buttons and the Talk button (shown below) to communicate with one or all zones. Use the Zone buttons (left or right) to select the zone you would like to contact. The display screen will display the phrase “Talk To:” followed by the name of the zone. By default, zones are named “Zone1, Zone 2, Zone 3...”. You can use the Valet Home Control app to customize these names to match your home. With Lync v3 controllers, you also have the option to force a zone to power on when attempting to intitiate a call to a zone that is currently powered off or in DND mode. The intercom microphone is built in to the LyncPad. Hold the Talk button to talk. The other zone communicates in the same way by holding their Talk button. The sound quality is outstanding since the same speakers used in that zone are utilized when using intercom. Along with the ability to communicate with each of the individual zones, the Lync system allows the user to talk to ALL zones at once. The process is the same as communicating with a single zone except that “ALL” is selected instead of an individual zone. Sub-zones with Mid-Level and Advanced Systems? With any of our systems, you can place an unlimited number of speakers into any one zone as long as you add the appropriate amplification to that zone. As-is, the DMA-1240 and DMA-1275 multi-channel amplifiers, as well as the built-in multi-channel amplifier in the MCA-66, can support 2 pairs (4 each) of 8 ohm speakers across 6 zones for a maxium of 24 speakers. When using a separate controller and multi-channel amplifier, if you are using less than six zones, then you will have unused amplifier channels available to add into one of the zones, e.g. 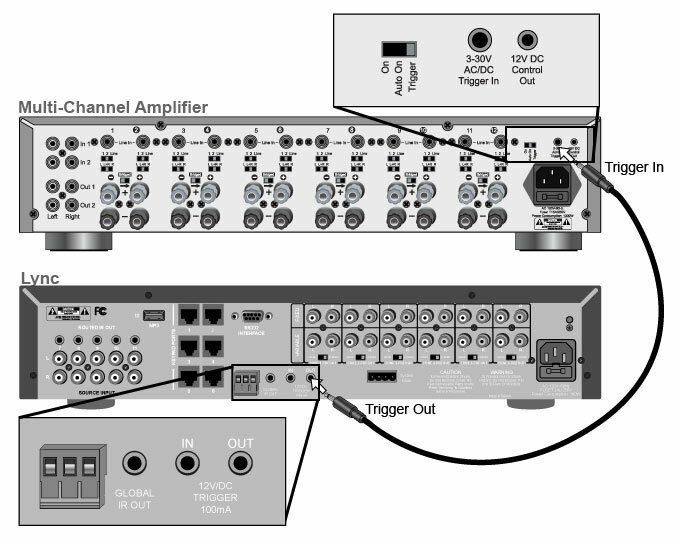 if you only have 5 zones, you could dedicate four of the channels on the multi-channel amplifier (instead of two) for one zone, and thus have 8 speakers in that zone. If you are utilizing all six zones, then in order to add more than 4 speakers per zone, you will need to install additional amplification. 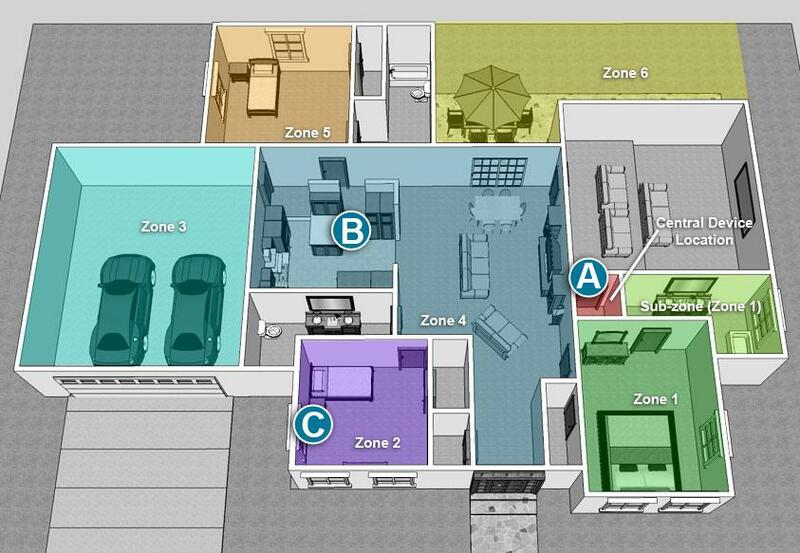 A zone can also be made up of several rooms, each with its own independent volume control. We define a "sub-zone" as an area within a zone that has independent volume control. A "sub-zone" is forced to listen to the same source selected for that zone, but its volume is controlled using a standard "in-line" volume control- either rotary, or slide-type. These volume controls are connected "in-line" between the amplifier and the speakers. When connecting additional amplifiers to the whole-house audio controller, use the fixed level outputs if you do not want the keypad's volume setting to impact the sub-zone's volume, i.e. the keypad in the primary zone has no impact on the sub-zone's volume level. Use the variable level outputs to have the sub-zone's volume adjusted simultaneously with the main zone. How do you properly install EZ-RJ45 tips on Cat5e cable? Correct installation of RJ45 Cat5 tips on Cat5 cable is critically important to the proper operation of your Whole-House System. The left-to-right sequence of the 8 color-coded wires inside the Cat5 cable must be arranged in a specific order before being inserted into the RJ45 Cat5 tip before being crimped using a special crimping tool. This process can be quite tedious and error-prone using traditional RJ45 Cat5 tips and crimping tools. To simplify this process and assure proper installation, HTD sells and recommends use of the patented EZ-RJ45 Cat5 tips and the patented EZ-RJ45 Crimping Tool. These two products are designed specifically to be used together and one should not be used without the other. Click here to view and download a PDF that describes how to install the EZ-RJ45 tips on the Cat5e cable. NOTE: If you plan to use Cat6 cable, you MUST use specific EZ-RJ45 Cat6 tips (which we also stock.) Cat5 and Cat6 tips look similar but are NOT interchangeable. Is the Lync system energy efficient? The Lync system is an efficient combinaton of a centralized Lync controller, centralized digital multi-channel amplifier, and LyncPad keypads spread throughout your home. Each of these components is independently designed for efficient power management, but each also includes features that enable the system as a whole to be even more energy efficient. Utilize the Trigger feature to automatically power up or power down the multi-channel amplifier. Connect a mono 3.5mm patch cable from the Lync Trigger OUT to an HTD Multichannel Amplifier Trigger IN. When a LyncPad is powered ON, the multi-channel amplifier automatically comes out of sleep mode to provide power where needed. 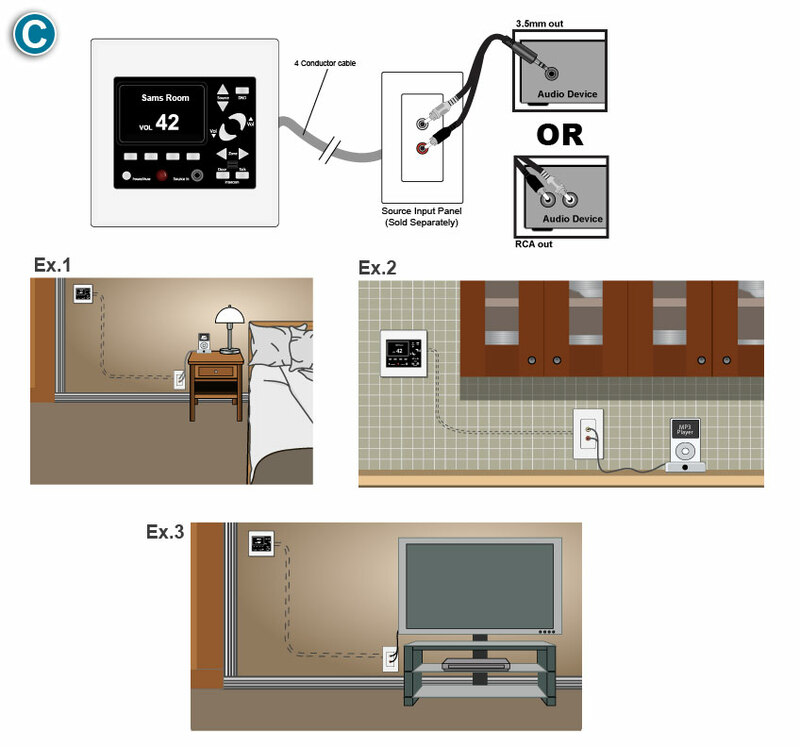 Once all LyncPads are powered OFF, both the Lync controller and the multi-channel amplifier automatically return to sleep mode, drawing only 5 Watts of power each. Easily power off all LyncPads to automatically put the Lync controller and multi-channel amplifier into 5 Watt sleep mode. Press and hold the power/mute button on any LyncPad for four seconds to power off that zone; continue holding for another three seconds to power off all LyncPad controllers (unless a LyncPad is in DND mode). Note: You can also conveniently turn on and set all zones to the same source for "Party Mode" by pressing and holding the source up or down button. Adjust the LyncPad brightness. LyncPads in each zone are powered via the Cat5/6 cable from the central Lync controller. The soft white, backlit buttons on the LyncPad are only lit while the LyncPad is actively being used/touched. After 15 seconds of inactivity, the backlit LEDs are turned off. The LCD display itself includes two brightness settings- one setting controls the brightness level when the buttons are actively being pressed, and a second setting controls the brightness level after fifteen seconds of inactivity. This second brightness level can even be reduced to zero so that nothing is displayed and no light is added to the room- great for those who prefer a dark room in which to sleep, and great for power management as well. Note: The LCD TFT screen on each LyncPad can also be uniquely set to its own background and foreground colors. Is the Mid-Level system energy efficient? The Mid-Level system is an efficient combinaton of a centralized controller, centralized digital multi-channel amplifier, and keypads spread throughout your home. Each of these components is independently designed for efficient power management, but each also includes features that enable the system as a whole to be even more energy efficient. Utilize the Trigger feature to automatically power up or power down the multi-channel amplifier. Connect a mono 3.5mm patch cable from the MC-66 Trigger OUT to an HTD Multichannel Amplifier Trigger IN. When a keypad is powered ON, the multi-channel amplifier automatically comes out of sleep mode to provide power where needed. Once all keypads are powered OFF, both the controller and the multi-channel amplifier automatically return to sleep mode, drawing only 5 Watts of power each. Easily power off all keypads to automatically put the controller and multi-channel amplifier into 5 Watt sleep mode. While a quick press of the Power/Mute button will mute the zone, holding this button for a full one second will power off the zone. Continue holding an additional two seconds, and all keypads/zones are powered off and the controller and amplifier return to sleep mode. Keypads in each zone are powered via the Cat5/6 cable from the central controller. The backlit buttons on the keypad are only lit while the keypad is actively being used/touched. After 15 seconds of inactivity, the backlit LEDs are turned off. The LCD display on the KC7 also includes two brightness settings- one setting controls the brightness level when the buttons are actively being pressed, and a second setting controls the brightness level after fifteen seconds of inactivity. This second brightness level can even be reduced to zero so that nothing is displayed and no light is added to the room- great for those who prefer a dark room in which to sleep, and great for power management as well. Note: The LCD TFT screen on each KC7 can also be uniquely set to its own background and foreground colors. How should I wire my home for the Lync system? 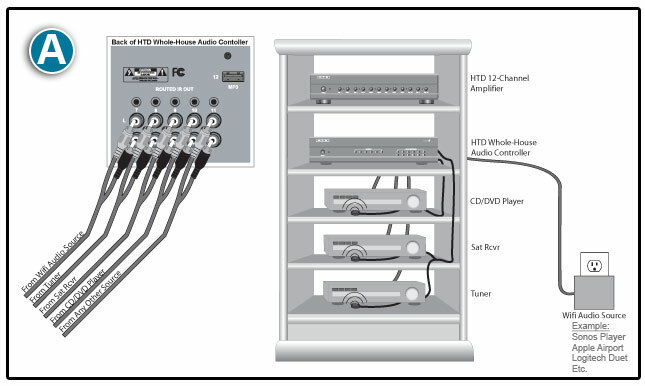 The schematic below shows how to run cable for the Lync whole-house audio system. LyncPad keypads spread throughout the home are connected to the main Lync controller via Cat5 or Cat6 cable. For additional source input connectivity options, run a four-conductor or Cat5/6 cable from one LyncPad in each zone to a Source Input Panel (sold separately). Speaker cable is also run from the same central location as the Lync controller directly to each of the speakers in the zone. However, if an area inside a zone (called a sub-zone) is being set up with volume control independent of the main zone, run the speaker cables first to a junction box that will hold a standard rotary or slide-type volume control, and then continue the speaker cables up to the speakers in that zone. Tip 1: If you are in new construction and are not sure what brand of system you are going to use, it is recommended that you run your speaker cable slightly differently. Note that most custom installers and home builders will pre-wire a home this way in order to allow for the most flexibility in choosing a whole-house audio system: run 4 conductor cable (+,- for both left and right channels) from the central area to the Keypad location in each zone; run 2 conductor cable from the Keypad location to each speaker in the zone. If you choose an Advanced Setup such as our own, you will simply tie the speaker cables together near the Keypad location. Should you choose a more basic setup that only requires independent volume control in each zone (i.e. all zones must listen to the same source), you will replace the keypad with a basic Volume Control (inputs connected to the 4-conductor speaker cables, and outputs connected to the 2-conductor speaker cables) and abandon the Cat-5 cables. Some mid-level systems, such as A-Bus systems that include a small amplifier in the keypad, will utilize the Cat-5 cable and the 2-conductor speaker cable. The 4-conductor speaker cable is abondoned because the amplifier is not centrally located. Tip 2: Run an extra Cat-5 cable into each zone to allow for future enhancements and flexibility. As an example, there are already devices on the market that allow you to run HD video signals over Cat-5 cable. Cat-5 cable is relatively inexpensive and it is much easier to add a cable now while you are running all of your other cables. How should I wire my home for the Mid-Level system? 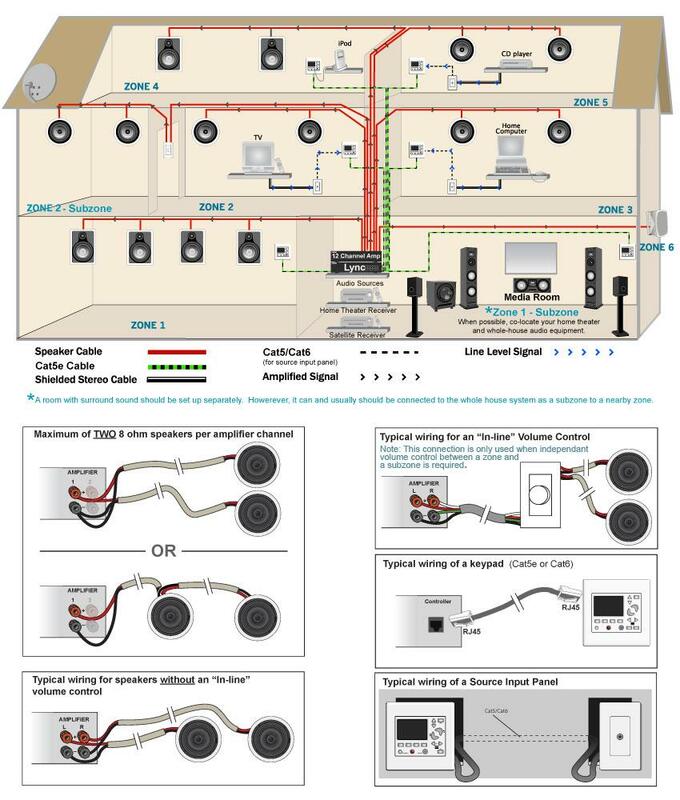 The schematic below shows how to run cable for the Mid-Level whole-house audio system. KC6 or KC7 keypads spread throughout the home are connected to the main controller (MC-66 or MCA-66) via Cat5 or Cat6 cable. Speaker cable is also run from the same central location as the Mid-Level controller directly to each of the speakers in the zone. However, if an area inside a zone (called a sub-zone) is being set up with volume control independent of the main zone, run the speaker cables first to a junction box that will hold a standard rotary or slide-type volume control, and then continue the speaker cables up to the speakers in that zone. If the LCD screen in a keypad appears to have missing pixels or small sections are dark, there is a good possibility that dirt or dust (often drywall dust) has found its way behind the screen. This often occurs in new installations where the keypad is not installed inside a clean junction box. Remove the keypad from the wall, and blow compressed air, preferably using a can with a straw attached to the nozzel, behind the screen from the top/side. It is best to do this while the keypad is still connected to the Cat-5 cable and is powered on. That way you can see the dust move and you'll know that you are hitting the right spot. You may need to tilt the keypad while you are doing this in order to get the debris completely out from behind the screen. Once the debris is gone, it is recommended that you clean out the junction box before re-installing, or if you are installing with a "mud-ring" (i.e. no junction box), cover the top part of the keypad with electrical tape to prevent debris from falling back behind the LCD screen. If this does not correct the problem, please contact us by phone to receive an official Return Authorization and instructions. Where should I place ceiling speakers in my room? Please note that this response pertains to speaker placement of two speakers in a room. If you are interested in speaker placement for surround sound, please return to the section titled, "Setting Up Home Theater Speakers". With stereo (or mono) in-ceiling speaker placement, you need to determine if the primary purpose of audio in the room is 1) creating a soundstage at one end that is optimal for a primary listening position at the opposite end, or 2) uniform coverage for background music. In most ceiling installations, the purpose tends to be more about coverage than creating a soundstage. With that in mind, you are usually better off putting the speakers along a line that extends down the center of the room along the room’s longest length. Then, position the speakers so that they divide the room into three equal parts as long as the distance between the speakers is not more than the height of the ceiling (rarely an issue). Example: A room that is 18 feet x 12 feet would have the two speakers placed along the 18 foot length such that they are each 6 feet from the wall and 6 feet from each other. A 30 foot x 18 foot room would have the two speakers placed on a center line along the 30 foot length such that they are each 10 feet from the wall and 10 feet from each other. If the ceiling height is 9 feet, then the speakers should be placed 9 feet from each other and 10.5 feet from each wall. If, instead, you have a defined listening position within the room, you’ll want to follow the same general guidelines with the exception that the speakers do not have to be along the longest length or along the center line. It is better to position the speakers opposite the listening position. Example: speakers in a home office are usually located opposite the desk. It is also a good idea to aim the tweeters (which produce the highest, most directional frequencies) toward the listening position. With the exception of our single-point stereo speaker (model MP-S65), all HTD in-wall/ceiling speakers have aimable tweeters. These suggestions are, of course, only a rough guideline but keep in mind that if the two speakers in the room are playing stereo (Left and Right), you do not want them too far apart or you will tend to hear one side of the recording more than the other depending on where you are standing in the room. Also, for best performance you want to avoid placing a speaker closer than 1 foot to any wall. When checking for components that might be causing this problem, look first at a computer being used as an audio source as this is a fairly common problem. Then also check for audio devices that are plugged into a circuit different from the one in which the whole-house audio controller and multi-channel amplifier are plugged into. All HTD speakers are rated at 8 ohms. And all HTD amplifiers are stable with a 4 ohm load. This means it is safe to connect two pairs (4 total) of speakers to any one zone. You do this by twisting together the + (positive) and - (negative) cables from both of the "Left" speakers before connecting them to the positve and negative posts on the amp (or a green connector on some models). Then, you do the same for the two "Right" speakers. Your cable might be too thick, once twisted together, to fit into the binding post or green connector. With binding post connectors, the best option is to use one of our High-End banana plugs to combine the cables together. But you can either twist together a short (1 foot) cable to the other twisted cables and then insert into the binding posts (or green connector), or instead of twisting ends of the cable together, you can alternatively strip a small (1/2 inch) section on one cable about one foot from the end of the cable, and then twist the second cable to that 1/2" section. Cover exposed cable with electrical tape. What is the best way to power my whole-house speakers? Good- Use a single stereo amplifier in combination with a speaker selector box with impedance protection turned on. A speaker selector box allows a convenient way to connect multiple pairs of speakers to a single stereo amplifier. Most selector boxes include a switch for turning impedance protection "on" or "off". When turned "on", your receiver will never see an unsafe impedance (most selector boxes prevent the impedance from ever dropping below 5 ohms), regardless of how many speakers you connect. The upside to this type of connection is 1) ease of installation, and 2) the ability to turn zones of speakers (HTD offers speaker selectors for 4 and 8 zones) on and off at the selector box itself without having to worry about impedance issues. The downside is that impedance protection has the effect of "choking" your power, meaning you won't be able to get quite the same volume out of your speakers compared to a set-up that employs impedance matching. Better- Use a single stereo amplifier in combination with impedance matching volume controls. An impedance matching scheme allows you to get the most out of your amplifier. While a speaker selector box is not mandatory, it is still a good idea as it provides a convenient method for connecting your speakers in parallel. In a carefully planned impedance matching scheme, you will turn the protection switch off thereby ensuring you get the most from your amp. The downside is that you must leave all zones turned on at the selector box so you can only turn zones off at the impedance matching stereo volume control. Best- The best, albeit more expensive, method for powering a whole-house audio system is to use a dedicated multi-zone amplifier, like our DMA-1240. This multi-use/multi-zone amplifier allows you to select between multiple audio sources for each zone and balance the overall volume level going into each zone. 35 discreet watts of power is provided to each of 12 channels (6 stereo zones) which is more than enough for this type of application. And because the amplifiers are discreet, you can connect up to two 8 ohm speakers into each zone without having to worry about impedance issues. And if you need more power in some zones than in others, side-by-side channels can be bridged to create a single 100 watt channel. For designs that require more than 4 pairs of speakers spread throughout the home, a multi-channel amplifier is really your best bet. And now, the DMA-1240 makes this upscale option affordable to the do-it-yourself enthusiast. In all of the above cases (good, better, best) you will likely want to position your whole-house amplifier in close proximity to your existing audio sources, e.g. your home theater equipment. 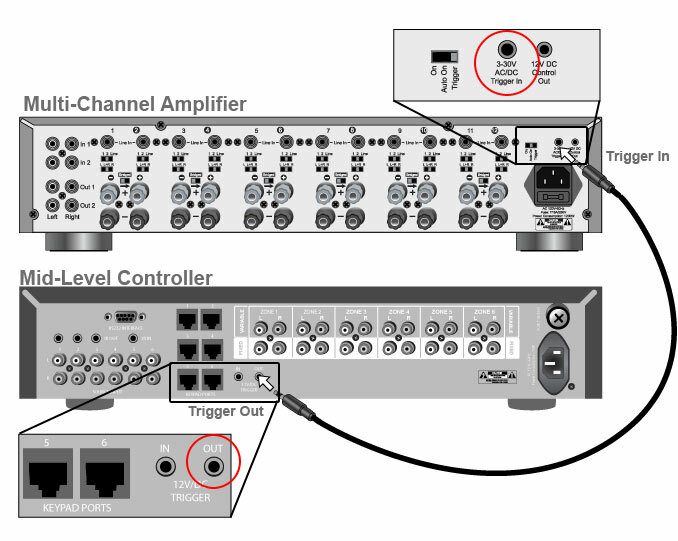 You can use a line level auxiliary output (or preamp output) on your home theater receiver to connect to the line level inputs on a stereo amplifier. In this way, the sources you have connected to your receiver (such as a DVD player, satellite receiver, etc.) can also be played throughout your whole-house audio system. If you use a multi-zone amplifier like our DMA-1240 you can also connect each source directly into the multi-zone amp so that you can have multiple sources playing at the same time and you decide which zone hears each source. If you are in the market for a new home theater receiver and want to power an extra one or two pair of speakers throughout your home, you should consider purchasing a receiver that can handle both. These receivers will have a minimum of 7 channels of power built-in; 5 channels for home theater, and 2 channels for stereo whole-house audio (note: some 6.1 receivers provide the option of using the sixth channel to power a mono whole-house system, but who wants mono instead of stereo?). Such receivers are usually dual source/dual zone, which means you can play two sources at the same time and choose which zone (home theater zone or stereo zone) hears each source. As an example, the home theater zone can be playing a DVD, while the stereo zone listens to a radio or satellite broadcast. The Denon 3803 is an example of this type of receiver. How do I utilize IR control with the Lync System? Every LyncPad has a built-in IR receiving eye. This IR eye is used to control the LyncPad from its remote control AND to pass IR signals through the Lync controller to other centrally located equipment. 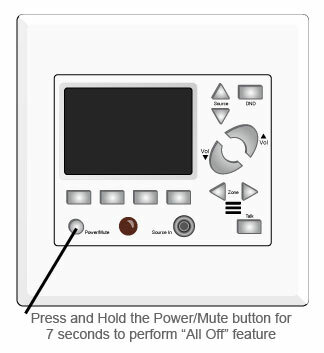 The LyncPad's basic functions- source selection, volume up/down, power, mute, DND, and the MP3 functions- can all be controlled from the LyncPad's own remote control. But the IR eye on the LyncPad serves another very important function as well- it passes IR commands from the standard 38K frequency band to the Lync and then on to your other centrally located equipment with the use of the included IR emitters. In other words, you can control a centrally located device simply by pointing the IR remote control for that device at any LyncPad. How do I utilize IR control with the Mid-Level System? Every KC6 and KC7 keypad has a built-in IR receiving eye. This IR eye is used to control the keypad from its remote control AND to pass IR signals through the Mid-Level controller to other centrally located equipment. The keypad's basic functions- source selection, volume up/down, power, and mute - can all be controlled from the keypad's own remote control. But the IR eye on the keypad serves another very important function as well- it passes IR commands from the standard 38K frequency band to the Mid-Level controller and then on to your other centrally located equipment with the use of the included IR emitters. In other words, you can control a centrally located device simply by pointing the IR remote control for that device at any keypad. There is also an IR Input on the back of the Mid-Level controller. This allows you to connect a receiving eye (sold separately) for a room that does not have a keypad in it. This is often a nearby room such as a dedicated theater room or family room with surround sound installed. IR commands received at this eye are output through the IR Output on the back of the Mid-Level controller. The Mid-Level controller includes 3 IR emmitter outputs.IR output will output all of the IR signals allowing you to control a device even if it is not selected on the Mid-Level system. The eye on each keypad will pass IR signals to the source selected AND out through the output. The IR eye connected to the IR IN on the back of the Mid-Level controller will pass IR signals out through the IR output. Any tips for using & troubleshooting Cat5/Cat6 cables for whole-house? How does the MP3 feature on the Lync system work? A central MP3 player for always-available background music. Connect a USB flash drive full of your favorite music and you instantly have the perfect source for background music. The MP3 player is not intended to be your primary music source- use a separate music streamer for that. Instead, the built-in MP3 player works best as an always-available source, with no moving parts, that can play continuously on a loop into areas like courtyards, guest bathrooms, hallways, landscapes, etc. 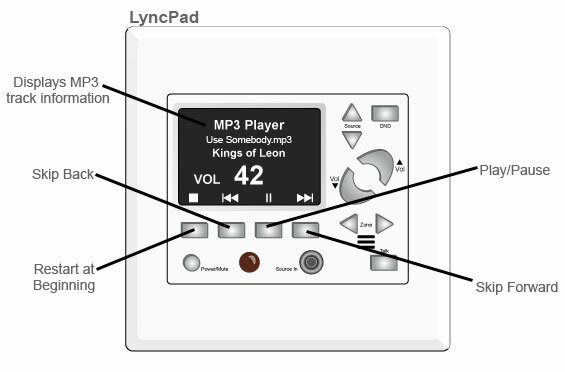 Control the centrally located MP3 Player from any Lyncpad or within the Valet Home Control app. Should I use a rectangular or round in-wall/ceiling speaker? Rectangular speakers are generally best for in-wall installations and round speakers are most often used in the ceiling. At one time, rectangular speakers tended to sound a little better than their round counterparts primarily because rectangular speakers had more room to include a better crossover (the electronics behind the moving parts that determine which components produce each of the frequencies). Around 1999, we, along with many other high-end manufacturers, began producing semi-circular circuit boards that contained comparable crossover parts and could still fit behind a round speaker. The result is that, for the most part, performance is no longer a factor when choosing between rectangular and round. Aesthetics is usually the best determinant. Most designers agree that round looks best in the ceiling because people are used to seeing other round items in your ceiling, primarily recessed lighting, so the more inconspicuous than rectangular. It is also easier to install a round speaker in the ceiling because you don't have to be concerned about properly aligning the edges of the speaker with the surrounding walls when cutting the hole. Also, in most cases, ceiling speakers are mounted into rooms where the primary purpose is "coverage" as opposed to rooms where the goal is to provide a soundstage for a specific listening location. Ceiling speakers will sound the same regardless on which side of the speaker you are standing or sitting because he tweeter is mounted concentrically to the woofer. All HTD in-wall and in-ceiling speakers include a pivoting tweeter that can help make the speaker more directional by aiming the highest frequencies toward the listening area. Lower frequencies spread out more quickly, making it difficult to ascertain the point from which they emanate. In contrast, rectangular speakers have the tweeter mounted above the woofer (when positioned vertically) or toward the middle of the room (when positioned horizontally). When mounted in a wall, it is easier to achieve a nice stereo image with rectangular speakers than it is with round speakers when the listening position exists directly between the speakers. So if your room is laid out with a specific listening area, all other considerations being equal, rectangular in-wall speakers are preferred. If the goal instead is to evenly cover an entire room with music, a pair (or two) of round in-ceiling speakers will do the best job. Any Tips for running Cat-5/6 cable for whole-house audio? Do not run Cat-5/6 cable within three feet of fluorescent lights. Avoid running Cat-5/6 cable parallel to high voltage lines. Always cross Cat-5/6 cable at a 90 degree angle. Do not split or route Cat-5/6 cable through an ethernet hub or switcher. Cat-5/6 may be run through a passive patch bay as long as point-to-point connectivity is maintained. But keep in mind that every time you pass through a connector, there will be some signal loss. If possible, try to maintain a point-to-point connection. 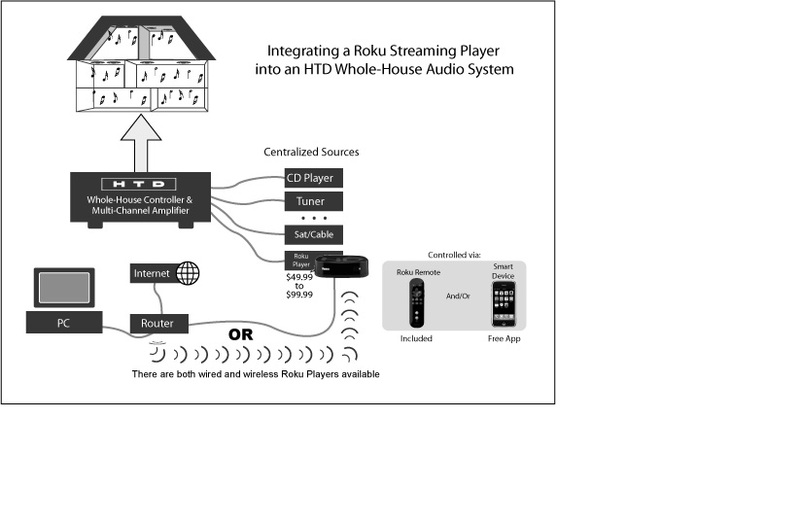 How do I get music from the Internet or my PC into an HTD Whole-House Audio System? In most cases, you can use your PC or MAC just as you would any other source, such as a CD Player, Tuner, iPod, etc. 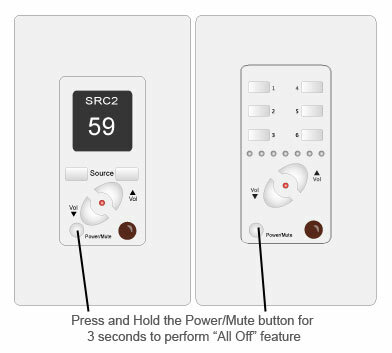 Simply connect the stereo audio output on your PC or MAC into one of the Source Inputs on an HTD Mid-Level or Advanced system. I only have room for one ceiling speaker, what should I do? 1.) If your whole-house audio setup includes one of our multi-channel amplifiers, we include a feature for "merged stereo". This setting allows you to "sum" the left and right channel of information at the amplifier before sending the amplified signal to a regular, single in-ceiling or in-wall speaker. In this situation, you run two-conductor cable from the amplifier to the speaker. If you are installing a stereo volume control in between the amplifier and the speaker, you will only use either the left or right input and output on the volume control. Please note: If you are using the multi-channel amplifier in combination with just one or two sources, then every channel on the multi-channel amplifier can be set up for "merged stereo". However, if you are using the multi-channel amplifier with a more Advanced Setup that includes a separate controller for switching between more than two sources, then only two of the zones for each multi-channel amplifier can be set up for merged stereo. Please contact us by phone for further explanation. 2.) If you are using a more basic whole-house audio setup where a single stereo amplifier is used to power all of the speakers in the home, then you will need to install a special stereo in-ceiling speaker in every room that just has one speaker. The MP-S65 is our only speaker model that accepts both the left and right channel of information. The MP-S65 includes two tweeters (one for the left channel and one for the right) and a dual voice coil woofer (one for the left and one for the right). For this speaker, you run four-conductor cable from the stereo amplifier to the speaker: positive and negative for the left channel; and positive and negative for the right channel. If you are installing a stereo volume control in between the amplifier and the speaker, you will use both the left and right inputs and outputs on the volume control, just as if you were connecting to two speakers. Our MP (Multi Purpose) line of speakers offer great quality and produce a very nice sound, similar to speakers you might find at Best Buy only at a fraction of the cost.We designed this line with polypropylene cones, a silk dome (not just a fabric "soft" dome) tweeter, and a nice crossover.These are very similar to something like the Polk RC series with a few additional features that Polk does not offer on their RC line, such as the +/-3dB switch for the tweeter which allows the speaker to be slightly customized for your room or when matching the sound to other speakers in the room. This product line was primarily designed for general listening applications, such as whole house audio or background/ambient music. All of our in-wall and ceiling speakers have high power handling which means they will not distort at volume levels higher than most people will ever listen to. 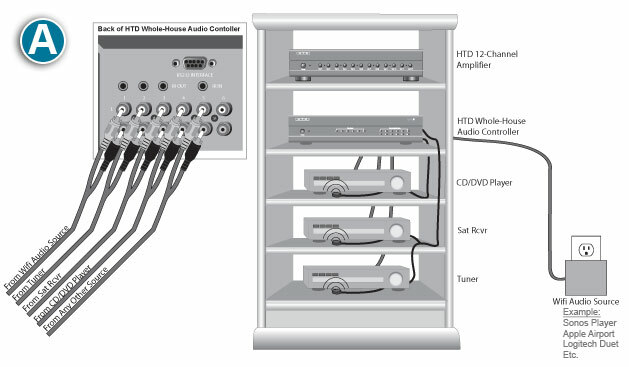 The HD (High Definition) line is more similar to a custom-install brand, such as Niles or Speakercraft, and was designed more specifically for critical listening applications. This includes home theater/surround sound rooms and dedicated listening rooms. The HD line was designed with aluminum woofers, ceramic-coated aluminum tweeters, and a 2nd order crossover.The lighter weight and stiffness of the aluminum drivers allows for a quicker, more accurate response from the woofer. Our ceramic-coated tweeter provides all of the crispness of other high quality metal dome tweeters with the added benefit of no ringing or harshness due to the ceramic coating. The end result is that the HD line produces a cleaner, more detailed and more accurate reproduction of sound than the MP line. Where can I go to listen to HTD speakers? HTD speakers are only for sale directly from us, the manufacturer. Our prices are low because we do not use sales reps, or sell through distributors, dealers or retailers. We believe, and most audiophiles agree, the best listening environment for evaluating any speaker is in your own setting. While listening rooms at retail stores are good for narrowing the field, your final decision really should be made after listening to the speakers in your own home with your own equipment. HTD encourages its customers to do as much research as possible with other brands and then take advantage of our 30-day Guarantee to see how our speakers compare. Nothing in the same price range will come close to the quality of our components, the build and finish of our cabinets, and most importantly the overall performance in home theater and music. In most cases, if you don't agree that HTD offers the absolute best value in home audio, we'll send you prepaid shipping labels to get the speakers back and we'll issue a full refund, including your initial cost of shipping. Click here for complete details. Of course, if you are in the Dallas, Texas area, we'd love to give you a personal demo at our headquarters in the Plano Tech Center. Please call in advance to schedule an appointment- toll free 866-HTD-AUDIO. Our address can be found at the bottom of the About Us page. Can HTD in-wall and ceiling speakers be installed in a drop-down ceiling? All of our in-wall and ceiling speakers can be installed in drop down ceilings in much the same way as if into dry-wall. Cutting the hole is a little more tricky since if you go too fast, it is possible to crack the panel. But the most important thing to remember is to make sure that you have a sheet of bat insulation above the drop-down ceiling. If there is not one present, it is a good idea to cut a piece (typically 2' x 4') to lay over the back of the panel. If for some reason, you cannot lift the panel to insert the insulation, then you should be able to squeeze a 2' x 2' section through the hole that you cut. The back of the speaker will touch this insulation and that is exactly what you want. This will significantly improve bass performance and help drastically reduce sound being carried where you don't want it. How can I paint my in-wall or ceiling speakers to match my decor? The plastic frame can be painted with a brush, but spraying on the paint usually provides the most even result. The grilles should ONLY BE SPRAYED as you do not want to fill in the grille holes. You can find a spray bottle with a compressed air canister at most paint stores that allows you to mix your own paint. "Preval" is a common brand an they are usually less than $10. Every pair of our in-wall or in-ceiling speakers includes a cardboard template with a cut-out that can be used as a paint shield for the speaker. With the grille off, you place this shield inside the frame of the speaker covering the components. This protects them while they are being sprayed. Note that it is not intended that the speakers be installed when they are painted- it is better to line them up on some old news paper, paint cloth, etc., lay the shields inside each speaker and then spray. The grilles require extra care when painting them. You will need to dilute the paint with about 50% water and do only one or two light sprays. You do not want to "fill in" the holes in the grille or performance will be diminished. Another nice trick is to drop each grille, paint side up, about 10 inches (again on to news paper or a paint cloth) right after they've been sprayed. This will force any paint trapped in the holes to drop through. Installation instructions and tips are included in the Owner's Manual for each speaker. Is there anything I need to know about installing a speaker into an exterior wall? When installing an in-wall (or ceiling) speaker into a wall inside your home which is also an exterior wall, follow the installation steps in the Owner's Manual as instructed, but note the difference in how you handle insulation with a paper barrier. With an external wall, typically the insulation will include a paper barrier located toward the inside of the house. The speaker will not perform to its potential if the back of the speaker is pressed up against this paper. Instead, the back of the speaker should be pressed directly into the insulation material. With an exterior wall, the best way to achieve this is to peel away the paper that is exposed to the hole cut in the wall. This ensures that the soundwave coming off of the back of the speaker is properly "dampened" and that enough volume of air is located behind it. If you are concerned about cutting into the barrier, alternatively you can usually push in another piece of bat insulation (with no barrier) through the hole and positioned between the speaker and the paper barrier. A two foot section can usually be forced through the hole and spread properly, but the more insulation the better as it increases the volume of air trapped behind. The amount of air trapped behind a speaker has a significant impact on overall performance, especially in the mid and lower bass frequencies. What are the steps for installing in-wall/ceiling speakers? Click here if you are installing one of our High Definition in-wall/ceiling speaker. Click here if you are installing one of our Multi-Purpose in-wall/ceiling speaker. How do I remove a grille from an in-wall/ceiling speaker? When you receive your in-wall and in-ceiling speakers, they are packaged with the powder-coated aluminum grille in place. They must be removed prior to installing the speaker and then reinserted once the speaker is installed. The screws of the mounting ears will press against the back of the grille. The grille will pop off into your lap. Note: The grille is intentionally very tight inside the frame. A loose grille would buzz or rattle during loud or bass-heavy operation. This "press-fit" design is used by most of today's manufacturers. Note: Our HD line of in-wall an in-ceiling speakers include a soft white sythentic fabric liner attached to the inside of the grille that is completely transparent to sound. It is used to provide a consistent appearance and should only be removed if you are painting the grille. After the paint dries, replace the cloth before reinserting the grille into the frame. What makes the HTD business model different/better? In 1998 HTD became the first consumer electronics company established specifically to sell its own brand direct to consumers via the Internet. From the beginning, we at HTD have focussed on two things: making better products and providing outstanding customer support. Our mission is to provide products for home theater and whole-house audio that a do-it-yourself enthusiast can appreciate- including performance, features, build quality, ease of installation, and ease of use. Our business model of selling direct provides these products to our customers at prices that are far below other respected brands found at mass retailers and specialty stores. Home theater and whole-house audio projects can sometimes be overwhelming. Our customer support staff is top-notch with an average consumer electronics background of more than twelve years. Our mission is not simply to sell you our products, but to make sure that your project is successful. Together we determine if our products are right for your situation. Customer support is available toll free to everyone. Chances are you found us either through a friend or family member or stumbled upon us via the Internet. While most audio companies employ a large marketing campaign and sell to mass retailers (who usually mark the price up at least two times before selling to you), we prefer to sell direct to consumers and let those customers do the talking and advertising on our behalf. How long has HTD been in business? HTD was the first home audio brand created specifically to take advantage of the Internet's ability to sell directly to consumers. We believed that internet savvy consumers, willing to take a chance on a new company with an unprecedented risk free guarantee, would see (and hear) the inherent benefits of dealing directly with the manufacturer of the products they care about. Since our first sale in January, 1999, we've put our customers at the forefront of what we do, offering toll-free expert advice, a liberal return policy, and a warranty that requires no proof of purchase (we keep all that information for you). So send us an email or, better yet, give us a call on our toll free line. We love "talking shop". In fact, some of the best ideas for new products and product improvements have come from our customers. Read more about our history on the About Us page. Can I pick up my order to save the shipping cost? If you live near our facility in Plano, Texas you can pick up your order between 8am and 6pm Central time, Monday-Friday. It is best to place your order by phone but you can also place your order online and write "Hold for Pickup" in the shippng address and then contact us with the time you plan to drop by. And while you're at our facility, we will be happy to demo any of our products in our showroom. If you'd like, bring your own music or even a competitor's product. We always enjoy visiting with our customers and showing off our speakers. Does HTD allow payments over time? Not directly, but when you checkout using PayPal, you may be able to qualify for a payment plan. HTD currently only ships to the USA and Canada. We are, however, looking into utilizing "FedEx Cross Border" to handle International orders. Check back soon for more info. To minimize the mess when installing in-wall or in-ceiling speakers, use non-stick painter’s tape to secure a garbage bag directly under the location where you plan on cutting the hole. To remove the grille from an In-Wall or In-Ceiling Speaker prior to installation, simply use the dog-legs to push the grille out of the speaker frame. When you push the dog-legs toward the front of the speaker, the screw-heads will push against the back side of the speaker grille. Gently work your way around the speaker until the grille comes loose from the speaker frame. To remove the grille from an In-Wall or In-Ceiling Speaker after it has been installed, use a sharp, pointed tool like an Awl. Simply insert the tool into one of the holes on the grille as close to the outer edge of the speaker grille as possible; then gently pull straight out. Work your way around the speaker grille a few times to remove the grille. In a pinch, you can make your own tool with pliers and a paper clip! If you are still using multiple remote controls for your components, consider consolidating them all into a single universal or learning remote. These remotes allow you to select (or learn) the proper programming for each of your components. It’s also a great way to add extra remotes to your system for additional Whole House Audio zones! Need to place your equipment in a cabinet or out-of-sight but still have control? Simply use one of our IR distribution solutions! You will need an IR “Eye” to receive the signal, an IR “Distribution Block” to route the signal, and IR “Emitters” to transmit the signal to your components. It’s a great, low-cost way to control your hidden equipment. If you are hearing unwanted noise/interference from your speakers and can’t find the problem, try removing your cable/satellite receiver (and the cables) from the system. If the noise goes away when you unplug the cable/satellite receiver then you may have a ground loop. This may be corrected by using a “ground loop isolator” from your local electronics store. If you simply don't have the space for a subwoofer in your living room or bedroom, consider our HD-IWS10 In-Wall Subwoofer. You can keep the clean look and still make the most of your Surround Sound or Whole House Audio System! If you are installing In-Wall/In-Ceiling speakers, place a large square of fiberglass batted insulation behind each speaker (fiberglass side against the speaker). This will not only protect your speaker and maintain your insulation value; it can also help improve the overall sound quality of your speakers. Don’t forget! Always plug your A/V Equipment into a quality surge protector/line conditioner to help reduce potential damage due to electrical spikes. Not only will your components be protected, you can actually help extend their lifespan! Do you have speakers pre-installed in your home but none of the speaker cables are marked? You can actually use a 9V battery help track them down - simply touch the positive and negative wires from each speaker cable to the terminals on the battery. When you briefly touch the speaker wires to the battery, the speaker connected to the other end of the cable will produce a distinct “popping” sound. When setting up a Surround Sound System, always try to position the Center Channel Speakers as close to the television/screen as possible and preferably at ear level. This way the dialogue will sound as if it is coming from the same location as the person speaking on the screen. When using In-Ceiling Speakers for your front Left, Center, and Right channels in a Surround Sound application, keep the main seating area at least the same distance away from the speakers as the speakers are off the ground. For example - if you have a 10' ceiling, make sure you are sitting at least 10' or more back from the speakers. This will help reduce the “spatial dislocation” effect of having your speakers located above your display image. Setting up a surround sound system in your family room, but only need a single extra zone of speakers in another area? 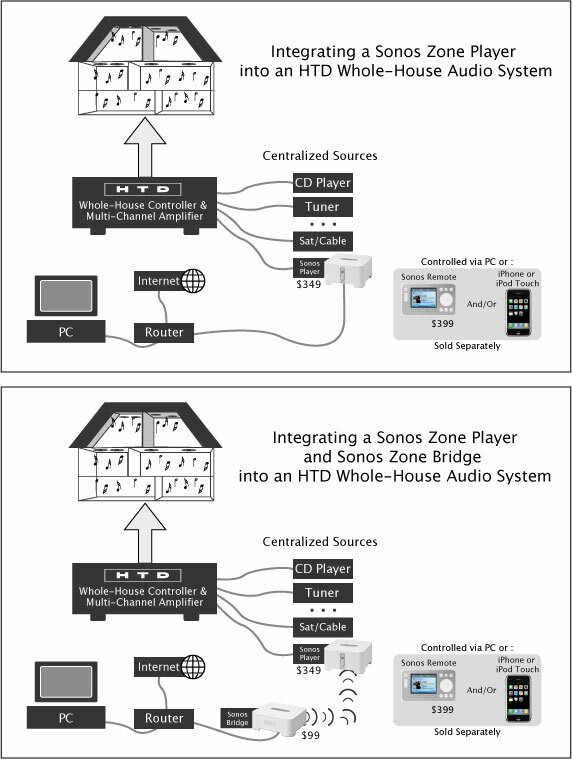 Consider a Surround Sound Receiver with a dedicated “Zone 2” output. This way you can still run all your Surround Sound speakers from the Receiver and select a different source for the speakers in Zone 2. Need more than one extra Zone? Consider one of our Whole House Audio solutions! 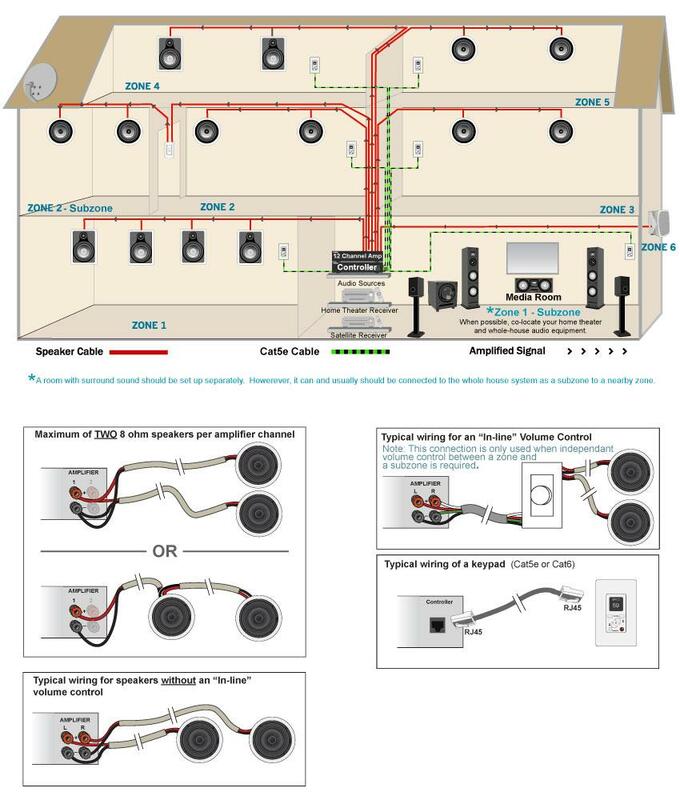 Did your installer run standard Coaxial (television) cable to the subwoofer location? No problem; you can use a Coaxial-to-RCA adapter and the subwoofer signal will be carried down the coax cable just as it would be with a shielded dedicated subwoofer cable. Want to get a better feel for how your new In-Ceiling/In-Wall Speakers will sound before installing them in the wall or ceiling? Use the included template and simply cut a hole in the speaker box, then install the speakers into the box and test them. They will still sound far better once installed in the wall/ceiling, but this will give you a very general idea of how the speakers will sound and is better than having them not mounted at all. When auditioning speakers, try to listen to familiar music in order to more accurately judge how a speaker sounds to you. We recommend taking a few of your favorite CD's with you and listening to your favorite tracks. If you find yourself wanting to turn the volume down or skip a track halfway through then that speaker may not be a good match for you, but if you find yourself wanting to sing along or turn it up then that speaker may be a good match for your ears! The absolute BEST method for auditioning speakers is in your own living space. Spend some time getting comfortable and listening to tracks that you know very well. Listening in a store (any store) can be deceiving and leave you disappointed. Your room is a major component in determining how a speaker sounds – carpet, tile, furniture, the shape and size of your space - all play an important role. Take advantage of or 30-Day Guarantee and if you're not thrilled we'll take the speakers back...we're really that confident in what we do. Do you have conduit instead of a pre-wire? Having a hard time fishing the wire through the bends of the conduit? Try this tip - purchase “pull-string” or "mule tape" from your local home improvement store. Then use a small plastic shopping/grocery bag and tightly tie the pull string to the bag. Crumple up the bag and insert it (loosely) into one end of the conduit, then attach a vacuum cleaner hose to the other end of the conduit and simply vacuum the bag through the conduit. Now you have a pull string in the conduit to attach your cable to! Use Banana Plugs for a clean-looking installation and to avoid “finger fatigue”. It can be a challenge to connect that many speaker cables in such a tight space and Banana Plugs can really make a difference! Retrofitting In-Wall or In-Ceiling Speakers? A simple and inexpensive “Stud Finder” from your local home improvement store will make the job much easier, especially if you have multiple speakers to install. Mounting In-Wall or In-Ceiling Speakers? Don’t have a Stud Finder? Make a tiny hole and use a clothes hanger bent to the same length as the speaker radius. Then just insert the hanger past the bend and rotate it to check for a clear space. Not sure how far apart you should place your Front Left and Right Speakers? As a general rule, use an equilateral triangle with your listening position as the bottom point and your Left and Right Speakers as the two upper points. Why use a remotely located Subwoofer Amplifier? A high-level, amplified signal usually offers better interference rejection than a low-level, non-amplified signal such as that carried by a standard RCA patch cable. To help avoid interference when running speaker cable, here are a few tips: Avoid running your cable parallel to electrical cabling. If you must cross electrical cabling, do so at a 90* angle and leave some space between them. Avoid running your cable near electrical fixtures, especially fluorescent lighting, major appliances, or dimmer switches. Need an In-Wall Center Channel Speaker? Use a single Speaker of the same type as your main Left and Right Channel Speakers. In an ideal world all your Surround Speakers would be the same anyway! Always try to match your Front Left, Front Center, and Front Right Speakers. This will help you create a seamless front soundstage and minimize any “panning” effects as sounds move across the front Speakers. Instead of having an unruly (and unsightly) bundle of cables coming out of a hole in the wall, use Speaker Cable Termination Plates and Banana Plugs for a clean, organized, and professional appearance. Don’t forget about the Pivoting Tweeters on our HD and MP Series In-Wall/In-Ceiling Speakers! Because higher frequencies are perceived as more directional than lower frequencies, where you aim the Tweeter can make a big difference in how your system sounds. When Installing In-Ceiling/In-Wall Speakers, use non-stick blue painters tape to outline the framing behind the drywall. This will help you visualize the correct speaker placement and can assist in placing multiple Speakers symmetrically. Use our Pre-Construction Speaker Brackets to properly locate your Speakers before the drywall is installed. Not only will this help the drywall contractor cut the correct sized holes, it will let you visualize the Speaker layout so any adjustments can be made before it’s too late. Don’t just place your Subwoofer in a corner – you will usually get better results with just a little bit of experimentation. Try placing your Subwoofer in your seat, then power up your system and walk around your space until the Subwoofer sounds the best. Then put your Subwoofer where you were standing! When organizing all the cables at your equipment location, try to run all the electrical power cables on one side of your equipment and all the signal and speaker cables on the other. This will help reduce any interference from the electrical cables. If possible, try to use a dedicated electrical circuit for your audio/video equipment. Dimmer switches, appliances, and fluorescent lighting can all introduce electrical interference into your system which can result in an audible “buzz” or “hum” sound. Need to cut some holes in your drywall? Simple solutions are often better solutions – try using a manual drywall saw instead of a power tool. They are easy to use and usually allow for better control and a more precise cut. Have a “hum” in your subwoofer? If your subwoofer is plugged into a different electrical outlet/circuit that the rest of your equipment you may have a “ground loop hum”. Try an extension cord from your sub back to your main equipment power location to check. Is your Speaker Cable shielded? It should be. While amplified high-level signals resist interference better than low-level signals, over longer cable runs shielded cable adds an extra layer of protection and can help you avoid audible interference issues. Toe-In? What’s that? By adjusting the angle of your Front Left and Right Speakers, you can improve the imaging of your whole system. Try turning them in towards you just a bit and see how it sounds. Keep experimenting until you get the best sound possible for your space! When placing Volume Controls near light switches, always be sure to secure the speaker cable on the opposite side of the stud bay from the electrical cable Even better, use the stud bay of the opposite side of the electrical switch box! Be careful when you pull your CAT5e cable – you should always maintain a minimum bend radius of 2” (3” for CAT6 cable). Kinking the cable or bending it too sharply can compromise the cable and reduce its effectiveness. Ambient light is the enemy of IR Remote Control Systems. Try to avoid placing any IR components in direct sunlight as it can “flood” the IR Receiving Eye and may interfere with IR signal transmission. Did you know that the longer the speaker cable length, the greater the effect it has on performance? While 16 Gauge Cable may be fine for runs under 50’, consider moving up to at least 14 Gauge Cable for anything longer to maximize your system performance. Heat is the enemy of consumer electronics, especially amplifiers. The hotter a component runs, the shorter its lifespan so always make sure that you allow for proper ventilation around your equipment. Avoid stacking hot components directly on each other – your gear will thank you! When pulling cables in the attic, never drape them across the floor. Not only is this dangerous, it can lead to cable damage and system issues. By securing your cable “high and tight” in the framing above, you keep your cables (and your attic) clean, accessible, and damage-free. Do you have an audio source that you would like to share with your Whole House Audio System but it’s located in another room? Use our Audio Baluns to send the signal back to your equipment using standard CAT5e/CAT6 cable! Did you know that many portable audio devices such as MP3 Players and Phones output a much less powerful signal than a standard CD Player or Cable Box? This can lead to different volume levels for each source – use an LGB-1 to increase your output and level match your sources. Try to keep your Front Left, Center, and Right Channel Speakers as close to ear level as possible. This will dramatically improve the imaging and performance of your front speakers. If you need to use In-Ceiling Speakers for your Front Left, Center, and Right Channel Speakers, use our HD-R65AIM Speakers for increased performance. They are designed to be more directional and will help direct the sound towards your listening area, not the floor. For a more natural and relaxed viewing position, try to position the height of your television or projection screen so that when you are comfortable and looking directly forward at the screen, your eyes come to rest approximately 1/3 up from the bottom of the screen. Speakers are the last and most important link in the audio chain – they are what actually create the sound you hear. A good set of speakers can make even mediocre equipment sound great but the reverse is usually not true. Plan your budget accordingly and purchase wisely! Don’t forget the +/- 3dB settings on our HD and MP Series Speakers. They allow you to better tune the speakers to your space by boosting or reducing the high frequency response. Have a tile floor? Try the -3 setting. Deep carpet and lots of absorptive furniture? Try the +3 setting. Want better sound from your television but not ready to jump to Surround Sound? Use our Audio Baluns to send the audio from the Cable/Satellite Receiver back to your Whole House Audio system. Then simply select that as the active source in the zone with the television! Have a large space that needs more than just one pair of speakers? All of our stereo and multi-channel amplifiers are 4-Ohm stable which means that you can power up to (4) 8-Ohm speakers in each stereo zone without additional impedance matching volume controls. More speakers at a lower volume will fill a large space and sound better than fewer speakers at higher volume. By maximizing your speaker coverage in a given area, you reduce the chances of having “hotspots” – places where the sound is too loud in comparison to elsewhere in the room. When using a “pull-string” to pull cable through conduit, always add an additional pull-string to your cable bundle before you pull it through. This way you always have one available in case you need to pull anything in the future! Label your cable! It’s much easier to wire up your system if every cable is labeled and you know where they came from (and where they go). Even simple peel and stick office labels will work in a pinch and can be a major time saver, especially if you need to make changes later. When painting In-Ceiling or In-Wall Speaker grilles, use multiple light coats of paint instead of trying to cover it in one application. This will help you avoid clogging the tiny holes that allow the sound to pass.